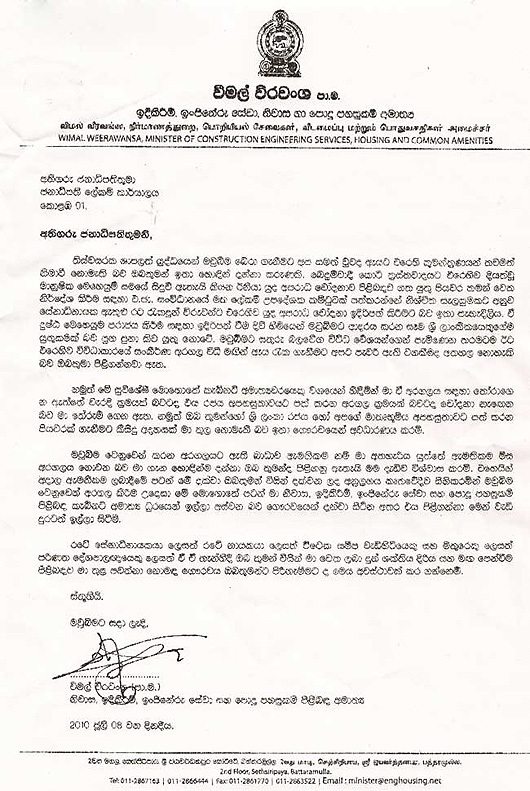 In a letter to the President, Minister Wimal Weerawansa has informed of his wish to resign from his Housing and Construction ministerial portfolio. In his letter he has claimed that it is difficult to carryout the struggle against the enemies of the country while holding the Ministerial post. Wimal in his letter adds that if his ministerial post becomes an obstacle to this struggle it the ministerial post that he should give up and not vice-versa. 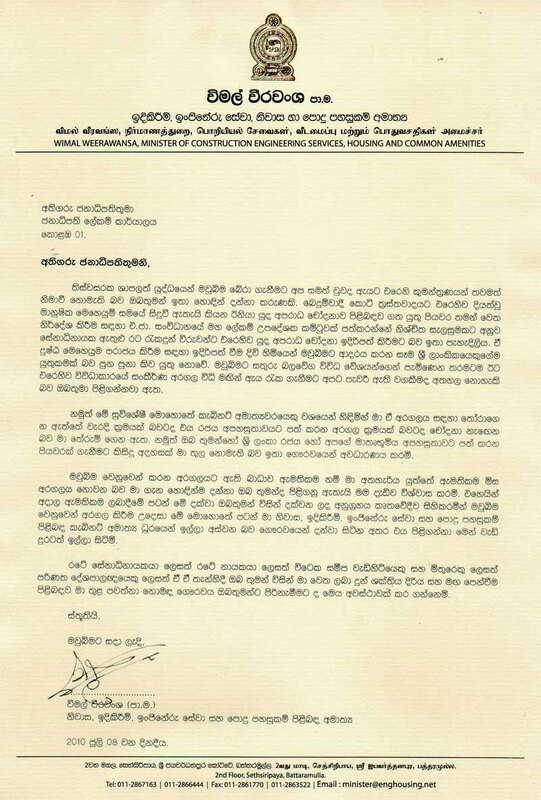 However when Ada Derana made an inquiry Secretary to the President, Lalith Weeratunga said that up to now he had not received such a letter of resignation. You can Read Same copy in Black & White Below. During the Vietnam invasion by yankee USA and lap dog Britain whole Vietnam villages were indiscriminately purged of innocent women and children and old men by the imperial USA with chemical bombs, agent red, that rained down fire. The world remembers the harrowing scenes of a frightened screaming girl running away naked with her skin hanging loose from the burns. Did the imperial West care? They continued to commit flagrant war crimes and crimes against humanity. It was the determination and fierce resistance of Vietnam and the Vietcong that unltimately kicked the yankees out and the British lap dog. At the time 3 Vietnamese Buddhist monks immolated themselves by fire in front of the US office in Vietnam to make their point. All these factors contributed to the ultimate ignominious end of yankee invasion and the British imperialist lap dog. 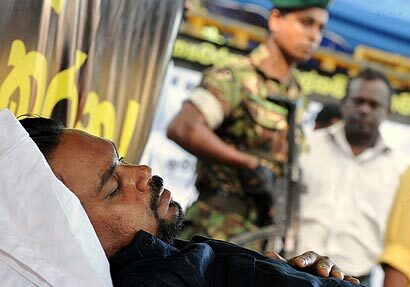 Wimal is also peacefully protesting against the flagrant abuse of the written law of UN by the yankee puppet, Ban Ki-Moon, for his dictatorial action of appointing a biased 3 member panel to investigate so-called war crimes towards the end of the War of Liberation against the evil LTTE terrorists, puppet of imperial West. I call on Ban Ki-Moon the US puppet to first appoint a panel of experts from the Freeworld to investigate and punish USA, Britain and Israel for their brazen and flagrant record of war crimes and crimes against humanity over 50 years which continues even today with no let-up. Israel has a horde of nuclear bombs they had developed but the imperial West is strangely silent about it. When and if Iran or any other Middle East country try to develop such nuclear bombs for their protection the imperial West is vociferously against it and use the UN to sanction Iran. This is not just.